The darkness of our sins calls us to account. Our shame calls us back to the mercy of God. To him alone may we turn and discover steadfast love and forgiveness. For he keeps his covenant even when we do not. When we are faithless, “he remains faithful,” (2 Tim 2:13) ever calling us to turn from ourselves, and turn again to him in repentance. When we repent and trust in him, he sanctifies us through the atoning work of Christ Jesus, who appeases God for us when we cannot. It is he alone who is just, able, and willing to rush at the speed of light to the Father, pleading on our behalf. This is why we may turn again and again to God. He is faithful to us for Christ’s sake, despite our sinful ways. So repent! For Jesus has come into the world to save poor sinners like us. Though we feel the darkness closing in around us, we need not remain in the darkness of sin. 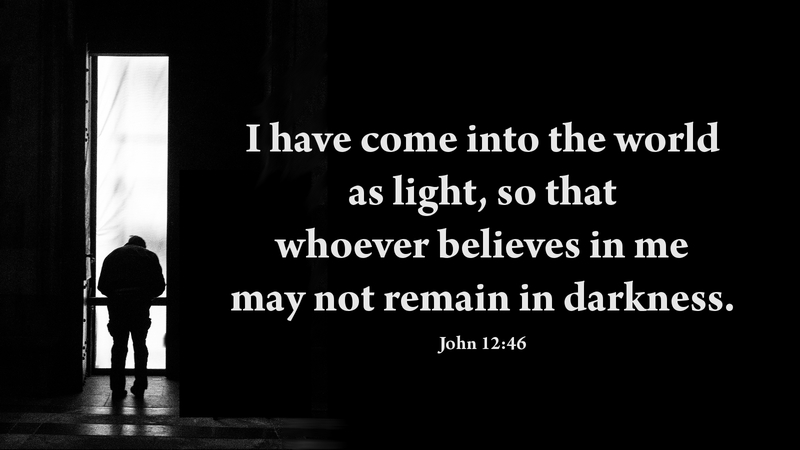 Jesus has come as light in our darkness, so that we may turn again to the light and know his Father’s faithful, loving forgiveness. Prayer: Holy Spirit, ever lead me to the light of salvation; through Jesus Christ the Lord. Amen.